Liewei Wang, M.D., Ph.D., Mayo Clinic professor of Pharmacology, received the highly prestigious Leon I. Goldberg Early Investigator Award for her pharmacogenomics research. Pharmacogenomics is the study of how a patient’s genes affect the body’s response to medication. She is the second Mayo Clinic faculty member to have received the award by the American Society for Clinical Pharmacology and Therapeutics. Andre Terzic, M.D., Ph.D., Mayo Clinic professor of Pharmacology and Medicine, received the award in 1999. 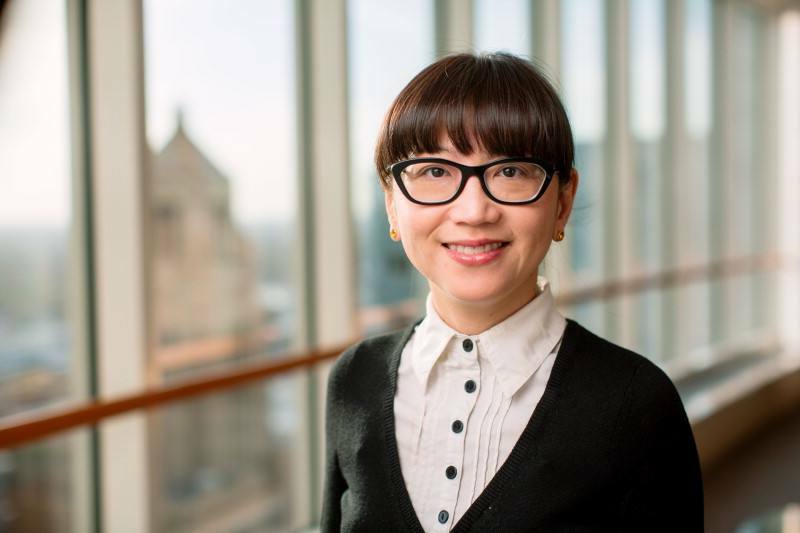 Serving in many roles, Dr. Wang is the associate director of the Pharmacogenomics Program within the Mayo Clinic Center for Individualized Medicine and co-principal investigator for National Institutes of Health Pharmacogenomics Research Network. She earned a medical degree from Fudan University Medical School in China and a Ph.D. degree in pharmacology from the Mayo Graduate School. As part of her pharmacogenomics research, Dr. Wang’s group has been working on applying the latest technologies to identify and understand how biomarkers might predict and contribute to how an individual respond’s to a particular drug, , especially drugs used to treat cancer. Biomarkers are substances in the body that can be used to measure health or disease. These biomarkers can be found in tissue, blood, urine and other body fluids. Collaboration with Mayo Clinic physician-scientists James Ingle, M.D., Matthew Goetz, M.D., and Richard Weinshilboum, M.D. to identify a series of biomarkers related to the initial treatment for patients with estrogen receptor-positive (ER+) breast cancer with a class of drugs called aromatase inhibitors. These findings could help make it possible to select a specific therapy based on a patient’s genotype. Collaboration with Mayo Clinic physician-scientists Dr. Goetz and Judy Boughey, M.D. to create patient-derived xenografts from breast cancer patients. These models, so called mouse “avatars,” can be used to identify biomarkers to predict response to medications. These research findings can be used to help physicians select a treatments based on pa patient’s molecular profile. Participation in a large population-based study using 10,000 Mayo Clinic Biobank samples to preemptively sequence 76 pharmacogenes and add this information to the Mayo Clinic electronic medical record. This new information will provide a clinical alert when physicians prescribe drugs that have been shown to have different levels of effectiveness or side effects based on a patient’s genomic profile. 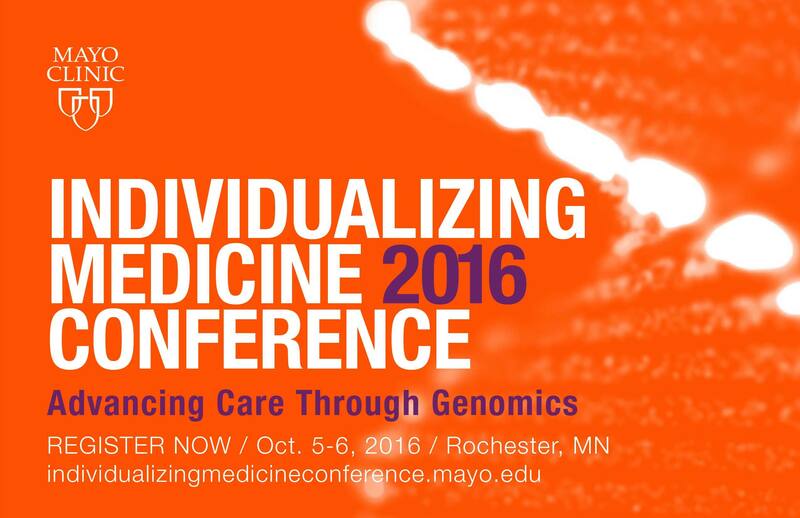 Attend the 2016 Individualizing Medicine Conference: Advancing Care Through Genomics. Hosted by the Mayo Clinic Center for Individualized Medicine, the conference will be held in Rochester, Minnesota on October 5–6, 2016. The conference focuses on integrating the promise of genomic medicine into better patient care. Experts in the field will offer updates on cancer research, on the latest discoveries in pharmacogenomics and what is happening with the NIH Precision Medicine Initiative. Focused breakout sessions and case studies will go into the details of research and their application to every day care in areas such as epigenomics, the microbiome, biomarker discovery and more. Experts in the field will be on hand to share their insights and experience. Follow conference developments on the Center for Individualized Medicine blog; on Facebook; or on Twitter, at @MayoClinicCIM and #CIMCon16 . You may also learn more about the conference on our video blog series, “Story by Story.” Eric Matey, Pharm.D., R.Ph., the Center for Individualized Medicine pharmacist, answers questions about PGx testing.